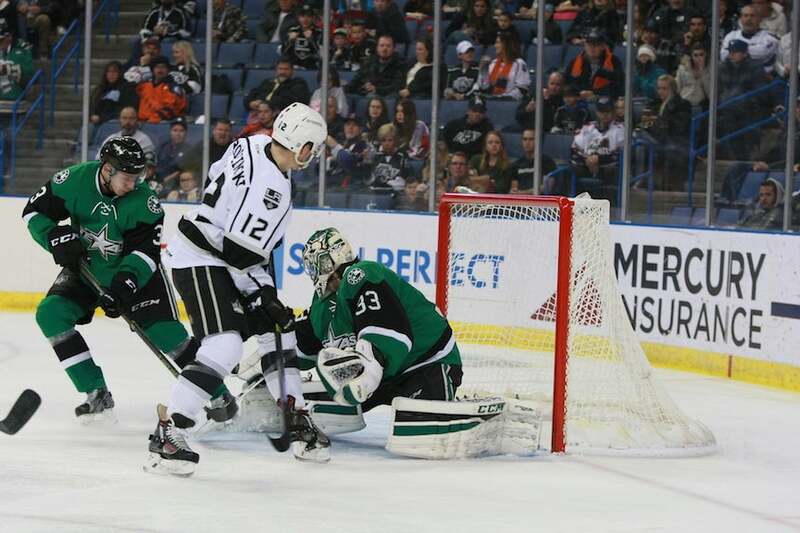 The Ontario Reign took on the Stockton Heat, Texas Stars and San Diego Gulls this week for a week record of 2-1-0-0 to hold the first-place position in the Pacific Division and reclaim the top spot in the Western Conference with an overall record of 30-14-3-1. The Reign and Heat met at Citizens Business Bank Arena in Ontario on Wednesday to close a home-and-home series. Forward Andrew Crescenzi scored a goal and two assists and line mates Jordan Samuels-Thomas and Valentin Zykov each hit the back of the net as the Reign cruised to a 6-1 victory, snapping a rare three-game losing streak. Reign leading-point producer Sean Backman also contributed with two goals. The winning momentum carried into Friday’s tilt against the Stars as Samuels-Thomas and Crescenzi again lit the goal lamp and team captain Vincent LoVerde buried the game-winning goal in the third period in a 4-1 triumph. The win snapped the Stars’ six-game winning streak. The Gulls tracked down the Reign on Saturday as Ontario kicked off a five-game road trip. Defensemen Kevin Raine and Nick Ebert would grab goals, but the Gulls slipped three shots past netminder Peter Budaj and potted an empty-net marker en route to a 4-2 win. Forward Sean Backman is first in the AHL with 166 shots and forward Michael Mersch is second with 149 shots. Goaltender Peter Budaj leads the league with a 1.58 goals-against average (GAA), eight shutouts, 28 wins and 2464 minutes played and a .935 save percentage. Budaj is fifth in the AHL with 929 saves. Defenseman Kurtis MacDermid is fifth among rookies with 91 penalty minutes and fourth with 23 minor penalties.